We tested the new ‘Hoptail’, The Budweis Mule, and we can definitely say The Botanist and Budweiser Budvar know how to create some hoppy goodness. 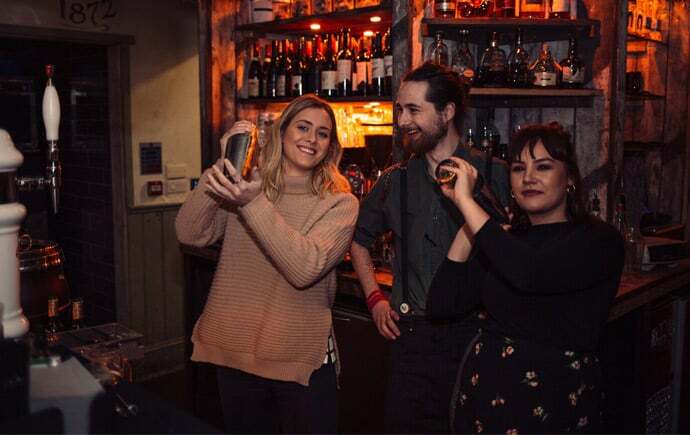 Budvar UK invited Exposed to The Botanist, located in Sheffield’s Leopold Square, for an evening of Hoptail shaking and beer education – and we were not disappointed. The night began (with a pint of Budweiser Budvar – of course) and group story time by the Budvar hop gurus, about the rich history of Budvar. Don’t be fooled, Budvar is a Czech company and completely different to the American brand Budweiser – lesson number one of the night. Unlike many contemporary lagers, Budvar is brewed in an unpasteurised tank and left to brew for a strict 102 days, then matured for a further 90, to create that to-die-for taste. Once this process is complete, the beer is then transported from Czech to England in temperature controlled mini tanks, to be piped straight into UK distributer’s specialised draught tanks. With plenty of Budweis Mules in our belly and spirits high from an impressive evening, we left The Botanist ready to share our new found knowledge. Head down there to try the beer and Hoptails yourself! Mix the ginger, bitters, sugar syrup, lemon thyme, gin, lemon juice and Cointreau in a cocktail shaker. Strain over cubed ice into a glass and top up with Budweiser Budvar Original. Garnish with lemon zest and lemon thyme.